Viewers have been counting down the days ever since it was announced there would be a potential Vampire Diaries spinoff featuring Klaus, Rebekah and Elijah in New Orleans. 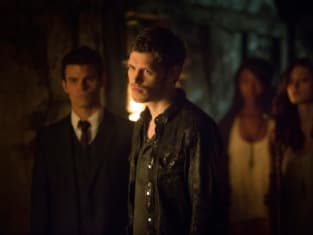 Tonight marks the backdoor pilot for The Originals and Joseph Morgan - who has brought delicious life to Klaus since The Vampire Diaries Season 2 - gave me a preview of what we can expect in The Big Easy and whether he’s ready for the will they/won’t they question regarding Klaus and Caroline. TV Fanatic: When did you kind of first get wind that they were toying with this original spinoff? Joseph Morgan: Well, Jim, it was a long time ago. I think it was maybe mid-way through season three, me and Claire, who plays Rebekah, went out to dinner and were talking about all the fan made fiction that we’d seen online for the Originals and we decided that really it would be a good idea to go to Julie Plec and say, ‘Look. We’re interested in possibly doing this for the show if you guys are interested.’ And we talked about it initially, Claire and I, and then about a week later completely coincidentally they came to us that they were interested in doing the show. Originally it was going to be possibly set in Chicago because we had done that great Chicago episode and then this thing just kind of evolved…[and] eventually it became what you’re about to see, this thing set in New Orleans. TVF: The Klaus-Rebekah relationship is always so full of tension and animosity, yet they’re family. Are they kind of on the same page in this episode? JM: No. They’re probably the most at odds they’ve been since Klaus put a dagger in her in the 1920s. JM: They’re really not seeing eye to eye at the moment so I think everything that Rebekah wants for the moment Klaus thinks are the things that make her weak. There was that huge betrayal of her where he found out when he found out where she buried the sword and then proceeded to dagger her. I think Elijah wants to be on the same page as Klaus and on the same page as Rebekah. He’s trying to bring them together but they’re not having any of it at the moment. TVF: There are some new characters we’ll meet in the episode. What’s Klaus’ relationship with Sophie? JM: He does interact with her [and] he’s very interested in what’s going on with the witches and indeed what sort of hold Marcel has over the witches so yeah. He absolutely has some interaction with her. TVF: Marcel was a one-time protégé of Klaus’. Does that make them allies or are they more rivals at this point? JM: Oh, you know, like everything on the show, it’s not so polarized. It’s complicated but certainly there’s history between them and there’s a mutual respect. Also, Marcel is very much in favor of embracing your true nature as a vampire and that’s something he learned from Klaus and that’s something that they certainly have in common. But then, also in Klaus’ absence, Marcel has built up the town and built up New Orleans to be something quite amazing and he’s a prominent figure in the town and I think that is a thorn in Klaus’s side as to what he could have had should he have stayed in New Orleans, you know? So I think it’s complicated but that’s what makes it interesting like any relationship on the show. I think my relationship with my siblings is the most interesting I have because I have such mixed feelings about it. TVF: Do they have similar powers or is there maybe something different that Klaus has that Marcel doesn’t? Or vice versa? JM: Klaus is an original vampire and he’s also a hybrid so he’s absolutely the most powerful being on the show, if not on the planet... so certainly Marcel has to acknowledge that and he’s at the mercy of that which Marcel is a powerful vampire and a motivated and aggressive and ambitious vampire but he’s not an original vampire nor is he a hybrid so there’re definitely some powers Klaus has that he doesn’t have. TVF: Who does Klaus kind of lean on in this episode? Does he have somebody who’s working with him? JM: He’s a little bit of a lone wolf. The problem is for Klaus that he doesn’t trust anyone a hundred percent because nobody trusts him. So he is very reluctant to make relationships, which he sees as a hundred percent dependable. He’s very reluctant to confide or rely on someone a hundred percent so there are people that he turns to in the episode. Certainly he’s consistently being challenged by Elijah to do the right thing and part of him wants to but part of him is just so self-destructive and gets in his own way so there’s not one character that he is consistently allied with from start to finish but, again, there’re complex dynamics that run through it and he’s not utterly on his own either. TVF: Any flashbacks in this episode? JM: No. Not in the pilot but from what I understand should we go to a series there’ll be a wealth of flashbacks because we have a thousand years to draw on. TVF: And then there’s Caroline. Would you personally like something to finally happen between the two of them or is it best to just move on from it? JM: No. I think it’s in the best place that it’s ever been in at the moment because the tease isn’t just going to go on forever. The writers and Julie as the show’s creator will give the fans more credit than just stringing them along indefinitely, so there will be some kind of payoff or resolve at some point I think but, also, I’m wondering how he’s going to have that happen. 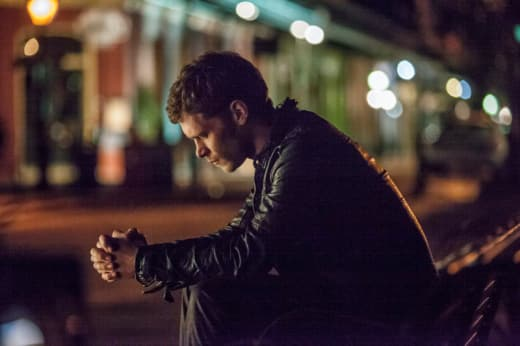 I think what’s really interesting is the struggle, Caroline’s struggle with herself…can she love a monster and Klaus’ struggle with can he really be the man she wants him to be? Is he willing to change enough? But at that moment he’s not willing to change enough and nor is she yet there’s something there between them and that’s really interesting. And he does make reference to her in the pilot. I’ll tell you that. It’s not just brushed over or ignored.